"Two different types of ERD can be differentiated: one short-lasting, localized to occipital areas and involving upper alpha components; the other longer lasting, more widespread, most prominent over parietal areas and maximal for lower alpha components. 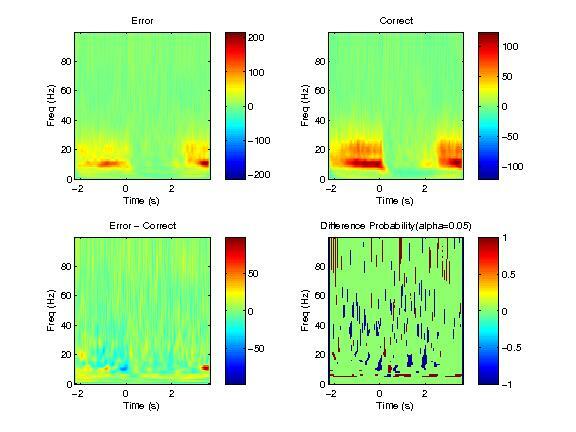 The former most likely reflects primary visual processing and feature extraction, the latter is more related to cognitive processing and mechanisms of attention. " N. Yamagishi (2005) reported attentional shifts modifies the latency and the amplitude in MEG induced responses in cuneus region (BA17). Fig. 4. Group analysis (n = 14) showing event-related spectral perturbation (ERSP) plots derived from the activation waveforms of the ICs reflecting calcarine activity for each subject and for each experimental condition (ISI = 1000 ms). The plots consist of 25 equally spaced bins with center frequencies ranging from 1.95 to 48.8 Hz and 32 equally spaced time steps with centers at 72 to 1372 ms. The group-mean ERSP plots show postcue power differences (in dB) referenced to a 200 ms precue baseline recording for (a) attention directed away from the stimulus and (b) attention directed towards the stimulus. Both spectral power increases (reddish hues) and decreases (bluish hues) are evident. 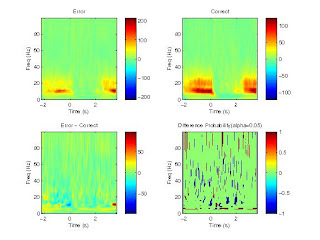 A random effects one-sample t test indicating significant ( P < 0.05 FDR corrected; df = 13) positive (reddish hues) and negative (bluish hues) event-related spectral power changes are shown for (c) attention directed away from the stimulus and (d) attention directed towards the stimulus. The cue onset time (t = 0 ms) and the stimulus onset time (t = 1000 ms) are indicated by vertical dotted lines in each plot. ==> different in virtual sensor power could imply attention directed to the stimulus (or the subjects were more vigilant in the correct trials), and thus more likely to perceive the change in speed -- a reasonable explanation? The following is an old fig that aligned to the onset of stimulus in left VF display, the high alpha (around 8 - 12 Hz) shows power difference when stimulus is on. I modified the scripts to get the data in mat format for and will soon modify the figs as soon as the data are generated. Pfurtscheller, G., C. Neuper, et al. (1994). 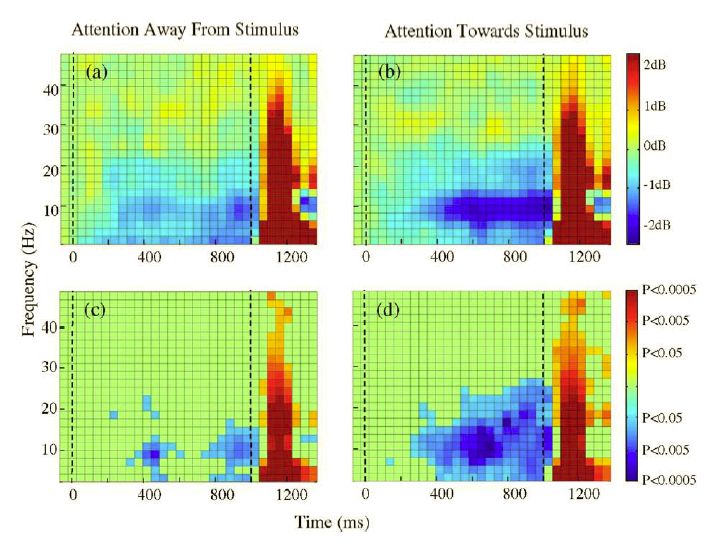 "Event-related desynchronization (ERD) during visual processing." International Journal of Psychophysiology 16(2-3): 147-153. Yamagishi, N., N. Goda, et al. (2005). "Attentional shifts towards an expected visual target alter the level of alpha-band oscillatory activity in the human calcarine cortex." Cognitive Brain Research 25(3): 799-809.